Anthony Brodeur in net for Shattuck-St. Mary’s Prep. The NHL Draft is approaching on June 30, 2013. It will take place at the Prudential Center in New Jersey. For one prospect it might be the perfect situational set up to continue a legacy. Anthony Brodeur has a chance to be drafted to the Devils where his father was drafted 1st round, 20th overall in 1990. 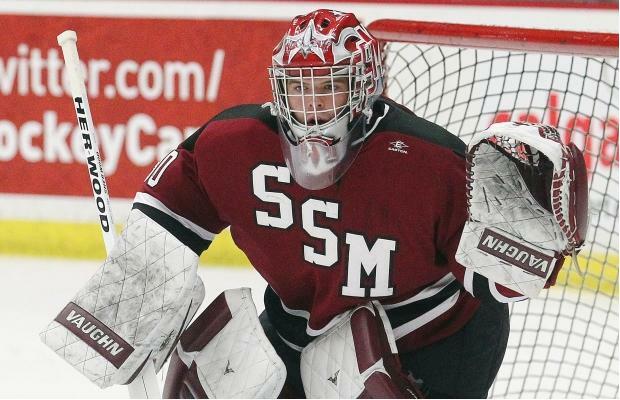 The 18 year old goalie prospect just completed his senior season at Shattuck-St. Mary’s Prep in Minnesota. He posted a 21-5-2 record with a 2.48 goals against average. He also finished with five shutouts and chipped in four assists. Question) What type of goalie style do you position yourself as? Hybrid, butterfly, or stand-up? Brodeur) I think I’m more of a hybrid goalie. I like to stay up, but going in the butterfly is a part of the game now a days. Question) Is there any specific routine you do before a game? Brodeur) Before the game, I do pretty much everything the same from pre-game meal until game time. I put everything on left to right, and also I throw a tennis ball against the wall for three minutes straight 15 minutes before game time. Question) Growing up, did you play any other sports or was it strictly hockey you were focused on? Brodeur) I played almost every sport. I was a very athletic kid, and growing up I really liked to try new things. I played golf, lacrosse, soccer, baseball, tennis, and some other sports. Now I really only play golf along with hockey. Question) Highly touted goalie prospect, do you get caught up in the media attention about being potential high draft pick? Broduer) I try to cancel out all of the attention. Being a hockey player, you’re not going to get anywhere reading what is said about you. There is always something good, but there’s always something that counters it that’s just as bad. I’d rather spend my time getting better than reading what people think about me. Reading about myself won’t make me a better player in any shape or form. Question) What would it mean to you if you were drafted by the New Jersey Devils? Brodeur) Being drafted by the Devils would be awesome, especially since I’ve been a fan my whole life, and because my Dad played there. But truthfully, being drafted anywhere would be an honor. I would be extremely happy to play for any team in the NHL at any point in my life. Question) Obviously your last name is legendary in the NHL. However, what do you think the biggest challenge will be to be known as Anthony Brodeur and not just the son of Martin Brodeur? Broduer) I think the biggest challenge will definitely be to create a name for myself. Always being in the shadow of my father will be something I have to get used to, but eventually getting out of that shadow would be unbelievable. I think I will need to work a lot on my game to be looked at as Anthony Brodeur.